Can You Invest Your Way to Plan Termination? Some interesting dynamics have been developing in the retirement industry with respect to defined benefit pension plans. Most plan sponsors that have maintained these plan types have either suspended or frozen them. This has been an effort to reduce/control their liabilities and funding obligations and to better respond to a younger workforce by replacing defined benefit plans with defined contribution plans. For many sponsors, the strategy was to simply look to positive investment returns to “close the gap,” expecting that assets would grow faster than liabilities, creating a positive scenario that would reduce the cash contribution requirements and lead to eventual plan termination. Unfortunately, this has not happened. Just prior to the dramatic economic downturn in 2008, many plans enjoyed a funding ratio in excess of 100%. Following the downturn, plans’ funding ratios dropped precipitously. As we all know, the market then proceeded to experience an historic run through 2017. The following chart of a survey conducted by Milliman of the Top 100 Defined Benefit Plans illustrates that funding ratios have remained stagnant since 2008, at 80% or below, even with the significant market upswing. All sponsors of frozen plans knew that liabilities would increase even though benefit accruals were fixed. This would be due to simple aging of the participant population―generally, very manageable. Combined with this historic investment performance over the past ten years, there was an expectation the funding deficits would return to pre-2008 levels. What was not anticipated was the corresponding increase in “carrying costs” and an extremely low interest rate environment. 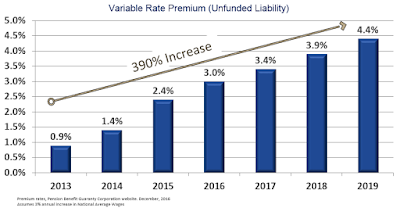 The single biggest cost increase of those listed has been PBGC premiums. Since 2012, the fixed premium has risen more than 130% while the variable premium has risen nearly 400%! 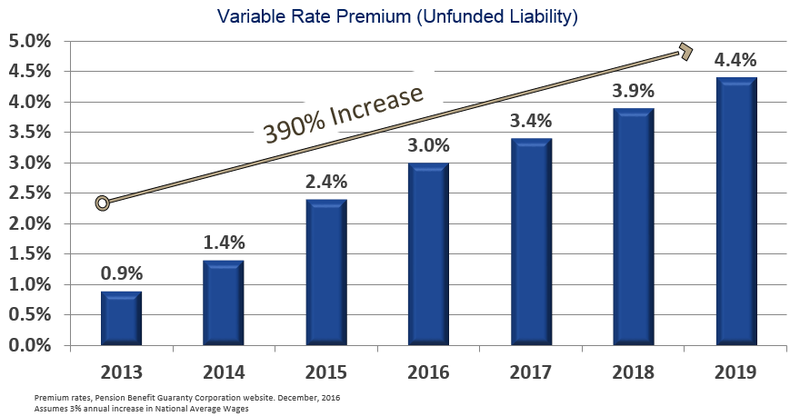 It is reasonable to expect more increases in the future as PBGC efficiency declines with the number of covered pension plans. If the end goal is plan termination, none of these expense increases have helped. Therefore, the changes we are beginning to see in defined benefit funding are not directed toward investment portfolios but rather toward the concept of pension risk transfer (PRT). Rather than try to simply offset increasing costs and liabilities with improved investment performance, many sponsors have looked to removing liabilities and costs from the plan. Transfer the responsibility for the current and future payment of benefits to a third party, a.k.a. a reputable insurance company. 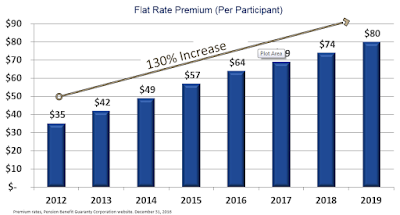 This not only reduces the sponsor’s liability but as importantly, eliminates PBGC premiums and benefit payment expenses. Again, if the end goal is plan termination, this ultimately will be the way in which all plan obligations will be satisfied. Not only could you de-risk current retirees, but terminated vested employees could also be included. PRT is a multi-step process that takes a series of small steps of planned and coordinated actions over a period of time to minimize liabilities so that when the decision is made to formally terminate, the financial impact has been greatly reduced, if not eliminated, i.e., putting sponsors in a much stronger position to actually terminate with the least possible financial impact. So at the end of the day, “Can You Invest Your Way to Plan Termination?” Probably not. This is not an absolute statement, but seems to be a clear trend based on the experience of the top 100 defined benefit plans in the U.S. If you accept this as a reasonable position, then the answer lies in what can be done directly by plan sponsors to reach the end goal. We think PRT is a very viable approach. To learn more about strategies to help organizations reduce and ultimately eliminate the financial burden of defined benefit pension plans, or to begin talking to a retirement plan advisor, please get in touch by email or by calling (855) 882-9177.